As long as Carmel Valley has been around, we have been providing the community with professional pool service. Weekly pool cleaning in Carmel Valley was a no-brainer as our company is located near the neighborhood. Not to mention we were and are still providing pool maintenance for other local communities around Carmel valley. being that we are a professional pool service company, we know we are providing value to carmel Valley pool and spa owners. with higher end pools in such a nice part of San Diego, we know that our service will be wanted because we ensure the safety of your friends and family with correct and balanced water chemistry. We also perform our weekly pool service to ensure the safety and longevity to your pools surfaces. Based on the average cost to remodel or build a new swimming pool, your investment needs to be in the right Carmel Valley pool service companies hands. With our professional weekly pool cleaning service, we provide the following steps each and every week. Our weekly pool cleaning process ensures that the swimming pool and spa are completly clean and ready to use. All you need to do is grab your towel and jump on in! The whole ProTouch team is fantastic and their continued support of a first time diy pool owner has turned what could have been a stressful undertaking into a manageable and even enjoyable part of home ownership. You can tell Kevin and Glen are passionate about what they do. After installing a heater, a pool light, and fixing parts that were neglected by the previous owner, they were so patient in making sure I was comfortable both operating the system and maintaining the pool.They have continued to support their work and products way beyond the install and continue to support me in the care of my pool way beyond my expectations. I consider myself very lucky to have found these guys!Janet W.
Click on link to see all of our pool service portfolios. Click on link to see just our Carmel Valley portfolios. Featured Carmel Valley pool service portfolio below. We perform one off pool filter cleaning services and we also perform recommended scheduled pool filter cleans for our weekly pool service customers in Carmel Valley. Click on link to learn more about our pool filter cleans. Pool algae cleaning is a specialized service that when done correctly resolves the problem as quickly with as little costs as possible. The average backyard pool service company does not know the best procedure to remove pool algae and that can cost you more money and down time in the long run. Click link to learn more about our Carmel Valley pool algae cleaning service. Pool drain and restarts are not always needed unless your waters chemistry has been neglected. When we test pool water to determine if you need a pool drain and restart, we test your phosphates and conditioner levels (CYA). If one of these factors are to high, it may be better to drain your pool. If these levels are ok, we can usually resolve your pool chemistry issues with proper pool service in Carmel Valley. Click link to learn more about our pool drain and restarts. Pool inspections are highly recommended for anyone buying a new home in Carmel Valley. When buying a home with a swimming pool, you want to know exactly what you are getting into with the existing pool or pool and spa. We provide detailed information with our pool inspections for all Carmel Valley and San Diego customers. Click on link to learn more about our pool inspection service. Hot tubs are very temperamental and should be serviced by a professional pool company. We provide quality Carmel Valley hot tub cleaning services to keep your hot tub safe and looking great. We make sure the water is always safe to protect your investment and your family and friends. Click on link to learn more about our hot tub cleaning service. A hot tub drain and clean is an important service that needs to be performed every 3-4 months. When your ho tub water starts to stay cloudy and not smell fresh, it is necessary to perform a drain and clean. Your Carmel Valley hot tub may also need to be drained and cleaned when it has sat turned off or neglected for any amount of time. Click on link to learn more about our hot tub drain and cleans. We also perform complete Carmel Valley pool equipment repair and new pool equipment installation services. When having a swimming pool near a canyon, there are things you need to be aware of. This is true for most of the Carmel Valley pool service customers and homeowners that do there own pool cleaning. When near a canyon, you will get airborne algae spores that come from the brush and dust and dirt that will get into your water. When this happens it is very likely to encounter a pool algae problem as the spores will become active when they enter the pool water. This is why all of our Carmel Valley weekly pool service customers are treated with a phosphate remover. When keeping your phosphates down below 120 ppb, the algae will be unable to spread at a rapid speed allowing you to control and get rid of the issue. When your phosphates are above 120 ppb, it is like turning on a switch and the pool algae can grow rapidly, taking over the pool and costing you a large amount of money to resolve. they have upgrades to enhance the overall look of the swimming pool, spa, and surrounding hardscape. When you have artificial rock designs for any of these areas, there are things you need to keep an eye on. One of those things is that the rock over time will start to lose it’s paint and seal. When this happens, you will need to have the artificial stone re-painted, textured, and re-sealed. If not over time the stone will fail and crack allowing water to get into the material causing more extensive damage. The other problem is after water has gotten into the artificial rock. This is when you may encounter rust appearing due to water seeping into the structure of the rock. When this happens, you will need to have the stone cut open so that the necessary rust repairs can be made. 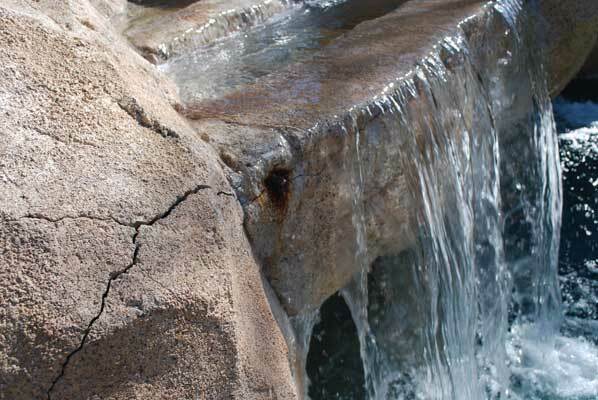 By properly taking care of your artificial stone water features, you will prolong the beauty and prevent unnecessary costs to make needed repairs. When my pool service guy stopped showing up Kevin was able to come out and determine what was needed to get my pool free of our algae problem. Once the issue was resolved we hired them to take over our pool cleaning and they also help with our koi pond. We would recommend them to anyone needing a great pool service company. Very professional and knowledgeable. Carmel Valley is located in San Diego, CA and is centered between the 5 and 15 freeway. The 56 highway also runs pretty much right through the center of town. This makes Carmel Valley a great place to live when wanting to access San Diego quickly. Carmel Valley is also a newer community in San Diego and that means the swimming pools and spas are more modern and up to date. As a more affluent neighborhood, the swimming pools and hot tubs were built at a cost that should have proper weekly pool service.